I paid $2.85 for a gallon of gasoline this weekend, at the gas station just up the road from our house, here in South Central Missouri. A couple of weeks ago while I was in the UK the price my brother paid was around $8.00 a gallon. The BBC calculator that I used to check the UK price tells me that I am paying $6.89 less per tank than the regional average here, and that were I to live in Italy my tank-full would have cost me $95 more, while it Venezuela it would have cost $43 less. (It cost $45 to fill my tank). The low cost of fuel is one of the benefits from the increased crude oil production in North America, sustained as it is by the increase in production from Saudi Arabia to balance the global market losses from other countries around the world. 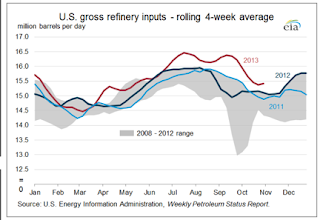 Further the EIA explains the refineries are helped with this low price by the high demand for diesel and the premium that it has achieved – causing refineries to run at record levels to meet the demand, and producing, as a secondary product, more gasoline that is thus being marketed at the lower price. It is a situation that the EIA expects to continue for a while. The relatively low price of fuel, here in the United States, particularly relative to Europe is starting to attract industries historically located abroad. The move to date is being led by those attracted by the cheap price of natural gas, particularly in the chemical industry. BASF, for example, cut the ribbon last week on a plant expansion in Vidalia, LA and just recently announced plans to expand its research facility in Beachwood, Ohio. The difference in being able to move to making parts from metal, particularly those that allow the repeated (over 600 times) firing of the gun is a very significant step forward. Thirty-four parts were made from stainless steel and Inconel 625 and then a grip was made from nylon, using a classic 1911 design. It is the different metal part of this that is worth underlining. The components were made by laser-sintering (which simplistically means that they used a laser to melt tiny particles of metal so that they would fuse together to make the model). The machine that is used to do this, at the present time costs between $400,000 and $1,000,000. It also has power and other logistic needs that require it be run in a commercial, rather than residential environment. 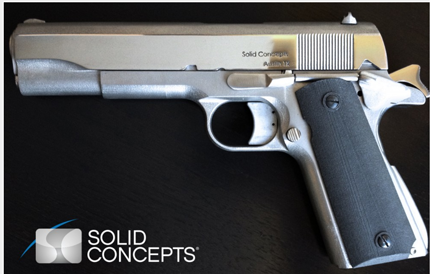 Solid Concepts has been using metal sintering for some time now to successfully create parts for a wide array of products. The 1911 gun is well known and people can relate to it in respect to its power and need for precise components. This story is about how additive manufacturing can be used to produce real, accurate parts in your industry whether it’s aerospace, transportation, medical, energy, consumer products, etc. The changes that this will make in industrial manufacturing, and in the global market for materials cannot be underestimated. At present parts are generally made by subtraction, taking large billets of material and milling and machining away all the un-needed bits, producing large volumes of scrap chips. None of that waste will be generated with this new process. Chris Hechtl has already produced The Wandering Engineer” series of Science Fiction books, starting with New Dawn that uses the concept widely as one of the bases for the stories. (Worth a read just to get some idea of the scope of what is to come - though I am also enjoying the series, as the books are written). It is going to change the way in which components are built, but it will also change the way in which minerals are processed once they are mined from the earth. It will be no longer necessary to cast metals into large ingots and then forge them down into smaller shapes. It is likely that, for many items in the near future that process will still be cheaper, but as time progresses and the costs of the process reduce (bear in mind that this is laser-based and remember how those costs have come down as lasers have become ubiquitous in society) that even large parts may be better made this way. Further it allows intricate melding of different materials to make products that are stronger and better suited to the need. Thus the objective of mineral processing in the years to come will be aimed at making fine powders rather than going through all the steps to make the larger ingots. That will, in turn, impact earlier stages of processing, and, while I don’t normally discuss my own work in these posts, I would draw your attention to a recent post from October 31st, down below, which includes a video of a small piece of equipment virtually instantly breaking half-inch coal into 5-micron pieces, which can be done with a pressure washer from the local hardware store. It also works in breaking out minerals from their host rock. The world indeed will change, and with those changes the power requirements of the future are also going to undergo drastic revision.